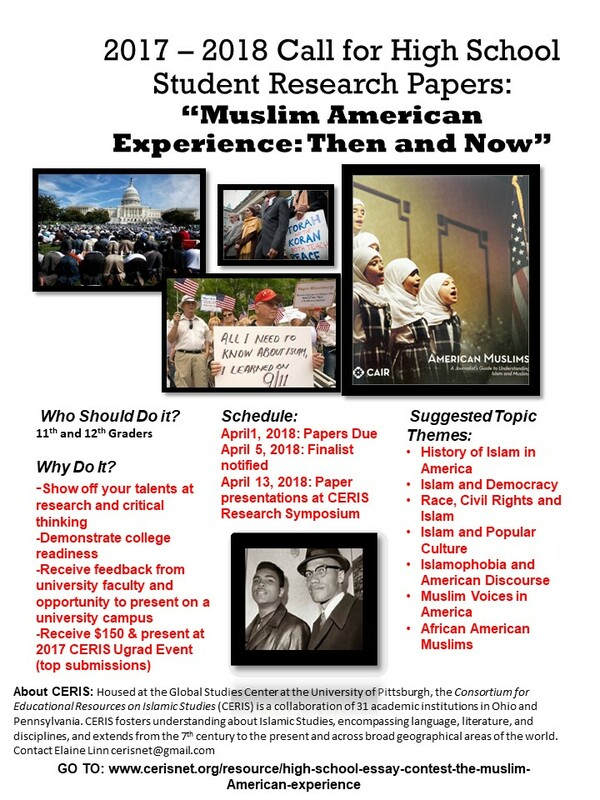 1)	To encourage original ideas and critical thinking around topics of related to American Muslim history and contemporary experiences. 3)	To receive authentic feedback from university faculty and to present student research in a university setting. Awards: Top three submissions will receive awards of $150, these and others may be selected to present their paper at 2018 CERIS Undergraduate research symposium. All student submissions will receive a notice of submission. Students should consider what are the main political, religious, and/or cultural considerations and influences within a selected topic theme and identify the main position, debates or themes in the historical or contemporary narrative where relevant. Students, their teacher who helped with paper, and guardian(s) will be invited to attend the 2018 CERIS Undergraduate Symposium at Duquesne University in Pittsburgh, PA on April 13, 2018. In addition to the selected high school student presentations, university students, faculty and a keynote address by noted scholar will present. Please see attached handout for complete instructions.